Sepedas cili merah: Garam siapa? Who salt? 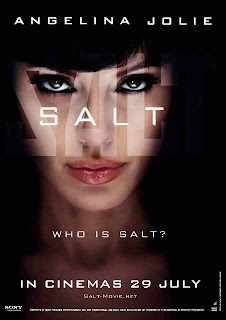 Angelina Jolie stars in Columbia Pictures’ Salt, a contemporary espionage thriller. Before becoming a CIA officer, Evelyn Salt (Jolie) swore an oath to duty, honor, and country. She will prove loyal to these when a defector accuses her of being a Russian sleeper spy. Salt goes on the run, using all her skills and years of experience as a covert operative to elude capture, protect her husband, and stay one step ahead of her colleagues at the CIA.